Robyn Fieser is the regional marketing manager for CRS in Latin America and the Caribbean. American Dream, which tells us we can do anything with hard work and determination. Some psychologists believe grit is a key trait for success. There’s no shortage of evidence connecting the two. Oprah Winfrey left a childhood of sexual abuse and poverty behind to lead a $2.9-billion media empire. J.K. Rowling went through divorce, depression and 12 rejections before publishing her first Harry Potter book. I have never seen as much grit as I have in the women we work with in Central America. Women like Maria Ramirez*, who fought daily to envision a future through a kaleidoscope of gang violence, domestic abuse and poverty. At 22, Maria experienced incomprehensible suffering. Her mother migrated to North Dakota when she was eight years old, leaving her in Guatemala to care for her little sister. They lived with their grandmother, who treated Maria like a servant. Daily life could be treacherous. 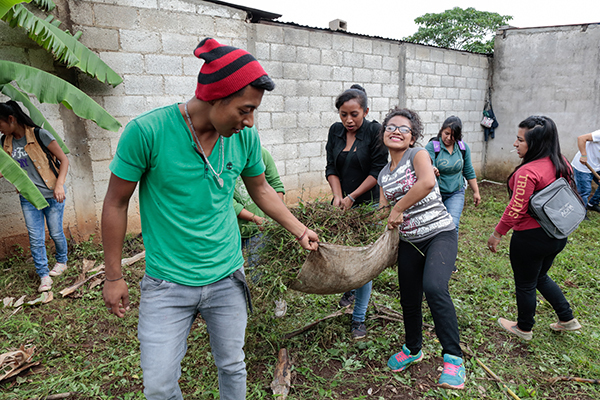 To get to school, Maria walked through an empty lot that divided gang-controlled territories and served as their battleground. Twice she was caught in gunfire. She was spared the forced recruitment of girls into gang activities that fuels migration. But her best friend was killed by gang members. She was pregnant by 17. She dropped out of school and got married. It wasn’t long before her husband started beating her. 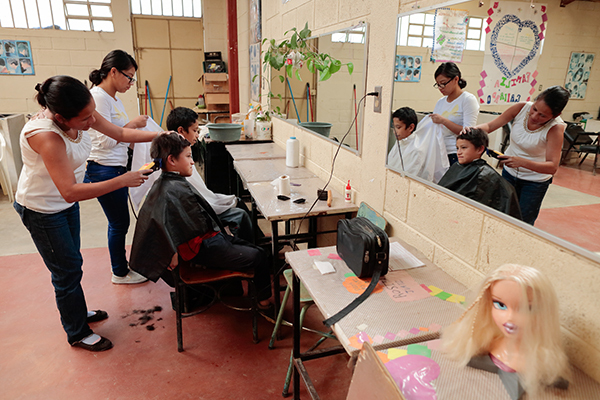 Then Maria found YouthBuild, a CRS program that provides education, employment and leadership to youth. Showing up every day for six months to the program was no easy feat for Maria. Daycare was a challenge. She was always short of money. And her husband became increasingly belligerent about her spending time away from home. But Maria finished the program. As did Katherine Ordonez Alejandro, 19, despite resistance from her father, who believed the program was a waste of time and forbade her from participating. Katherine worked out an alternate schedule with her instructors that allowed her to arrive home before her father. Eventually, he found out and kicked her out of the house. When I talk to female YouthBuild graduates, I’m struck by how many layers of marginalization they face. Jobs are scarce—especially for kids from bad neighborhoods—and poverty is rampant. Gangs can make simple things like getting to work dangerous. It’s no wonder so many young people believe their lives mean nothing. Katherine and Maria woke up at the crack of dawn every day to participate in YouthBuild with the hope of landing a job and getting ahead in life. To succeed, they fought their father, their husband, and their grandmother too, all of whom echoed the voice in their heads telling them they will never amount to anything. That’s grit. But grit is not enough. In YouthBuild, both girls found caring adults and a safe place where they could build resilience, get support, think critically and find their voice. That’s what happens at YouthBuild. While providing a pathway to a livelihood, it creates an environment for personal transformation and growth. It was the support and encouragement they received at YouthBuild that helped build the skills they needed to get a job. It gave them the confidence to change their lives and envision a different future. Maria has since left her husband and is studying English. Katherine works at a sporting goods store. She scraped enough money together to buy a small piece of land and plans to build a house. As we celebrate CRS’ 75th anniversary, I’m proud to be a part of a program that helps young women discover their grit and turn obstacles into opportunity.